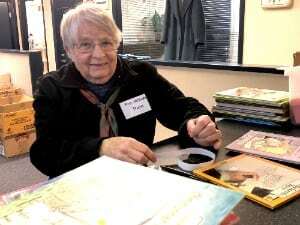 We spoke to Pamela Mather, a longstanding Habitat volunteer, she started volunteering at the Hamilton ReStore over 15 years ago. With so many horrible things happening in the world and in the news all the time, she says it’s been nice to be involved in something positive – assisting people into a nice, warm house – that’s what we are about. Habitat has transformed a lot over time, it has grown tremendously, and withit the sense of community has grown, she says. So, it makes sense that volunteering has developed a lot over the years too. Pam reflects on the ReStore atSumerset Street, it was much smaller and volunteers did not have roles like they do now. She likes being able to focus on pricing the books and jewellery rather than using the till and technology. The store mainly had clothing, the furniture was out in the back building. Now, the store has so much stuff,there’s heaps to pick from. The furniture is in the store, and the shop is a lot larger, she says. Pam hadn’t been in an op shop until she retired. Her mother made the clothes she wore, so she didn’t have to go shopping for clothes. Back then, it was normal for mothers to make clothes, and they were worn, whether you liked them or not. People with large familieshad hand me downs that made it through generations. Pam didn’t have any sisters, but she had the occasional things given to her. Her career before retirement and volunteering at the ReStore involved being Charge Tutor at the Waikato Hospital, she retired from there and went to work at St John as an instructor. Pam taught first aid to the public and schools.